Fair or not, the Florida Derby is generally considered the most important prep of the season, and has been so for about a decade. Over the last 11 years its winner has produced three Kentucky Derby winners (Monarchos, Barbaro, and Big Brown) and a pair of runner-ups (Empire Maker and Ice Box). Harlan's Holiday went off as the favorite in 2002 after romping in the Florida Derby, Quality Road would have been the favorite had he not suffered untimely quarter cracks a week before the 2009 edition, and Dialed In somehow went off as the public's choice last year (I will never understand that one) after his victory at Gulfstream. This year, there is no doubt that the Florida Derby is the most anticipated prep. Time will tell how important it as far as the Kentucky Derby is concerned, but the presence of Union Rags makes it the race of the season. If he wins--and does so convincingly--he will go on to Louisville as one of lowest-priced favorites in recent history. Big Brown went off just shy of 5-2 in the 2008 Derby, and Union Rags would certainly be lower than that, perhaps closer to the 9-5 price that Point Given was in the 2001 Derby. With all the recent negative publicity surrounding horse racing, we need a star 3-year-old in the worst way and for that reason I'm hoping Union Rags is as good as we all think he is. 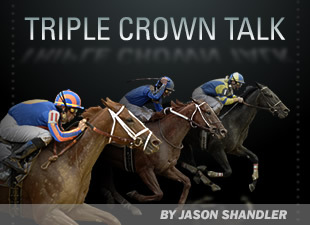 I hope he wins the Florida Derby by 8 lengths and the Triple Crown hype begins at 5:45 p.m. on Saturday. Bring it on. I'm not sure he is going to win by 8, but I do think he will win with something left. From what I saw in the Fountain of Youth, how he is currently training at Palm Meadows, and what people in the know are saying, he should be sitting on an even bigger race this weekend. I'm surprised they got eight horses to face him, but he will still go off at about 3-5. As far as a betting strategy, I'm just going to take small stabs at straight exactas. I'll take a gamble that El Padrino finishes out of the top two and instead use Take Charge Indy and Neck ‘n Neck to fill out my exacta. Take Charge Indy bypassed the Tampa Bay Derby (somewhat surprisingly) in favor of running in this tough spot. He finished two lengths behind El Padrino in a Jan. 29 allowance race over this strip, so he needs to improve a bit. I hadn't looked that closely at Neck ‘n Neck until someone brought him to my attention yesterday. He was an average fourth in the Fountain of Youth but had a bad start and was steadied on the first turn. In the Sam Davis one race earlier he had an even worse start and was forced seven-wide into the stretch, still losing by only three lengths. In his first start of the year the Flower Alley colt was second to Discreet Dancer in an optional claimer. I'll take a chance that he finally gets a good trip. At big odds, he may be worth a place/show bet as well. This race does not look nearly as strong, but it is worth $1 million and should be a decent betting race with 13 horses (12 betting interests). The coupled entry of Mark Valeski and Mr. Bowling will be heavy favorite, mostly because of Mark Valeski, who seems like he is on his way to stardom. I hate picking chalk in both weekend preps, but I think this colt is sitting on another big effort. He's training even better since the Risen Star and could get a nice trip sitting off of wise guy speedster Cigar Street. As Rosie Napravnik said earlier in the week, I think this colt is the "real deal." I want to also mention that although Mark Valeski is my pick, I am happy to be getting Mr. Bowling along with him. He ran a clunker in the Risen Star but I look for a much-improved effort in this one. He's been training like a horse that will revert back to his form from the Lecomte. The horses I'll use in my exotics, in order of preference, are Shared Property, Rousing Sermon, Z Dager, and Windsurfer. Shared Property finally draws a decent post after being wide in the last two preps. He ran lights out in the Lecomte and like Mr. Bowling, was not a factor in the Risen Star. I'm predicting an improved effort this time at what will probably be a square price. He will race with blinkers on. Rousing Sermon was off the board in both California preps but Santa Anita Speedway was not right for him so the dead closer should appreciate the long stretch at Fair Grounds. He should be coming at the end. Z Dager has hit the board in the other two Fair Grounds preps and for that reason I'll stick with him. Todd Pletcher's Windsurfer broke his maiden impressively at Gulfstream going two turns last month and will be part of the pace. Maybe he hangs on for a piece. Good luck this weekend. Who do you like?